Is there a prerelease program for Adobe Exchange? What’s new in the current prerelease? What about Add-ons that I get from the Creative Cloud desktop app? Adobe Exchange/Adobe Add-ons is a commercial marketplace that enables distribution of resources and software, integrated with Creative Suite 6 and Creative Cloud desktop applications. How is the new Adobe Exchange different from Exchange Classic and Photoshop Marketplace? The new Adobe Exchange (http://www.adobeexchange.com) is integrated with Creative Suite 6 and Creative Cloud desktop applications. It provides an in-app experience for users where they can browse, search, and buy — all from a website https://creative.adobe.com/addons. The website filters the products to offer those that can be loaded into the current app. The new Adobe Exchange/Adobe Add-ons allows you to offer products for sale, with an integrated, seamless payment workflow through a third-party e-commerce vendor. Not currently, however other prerelease programs which might incorporate Adobe Exchange are under consideration. A former developer prerelease program based on the project’s codename; Agora, was called the “Agora Prerelease Program”. There are two options for participating as a producer of Adobe Exchange content: you can use the Community version that lets you submit up to 10 products, of which 2 can be paid; or you can sign up to be an ‘Unlimited’ Producer, which allows you to provide paid and trial versions of your product (in addition to free products) and lets you make unlimited submissions. If you would like to offer paid products for sale through the new Adobe Exchange, please email avetting@adobe.com, with the Subject: Account Upgrade in order to be considered. What is the Adobe Exchange Producer Portal? Where can I find the Adobe Exchange Producer Portal? What tools can I use to create products for Adobe Exchange? Does using Adobe Exchange prevent me from selling my products elsewhere? What content can be distributed through Adobe Exchange? What kinds of content are permissible? Can CS plug-ins be distributed through Adobe Exchange? Can I edit or delete products after I publish them? Can I preview my content before submitting it? The Producer Portal is a web service where you can submit your product for approval and distribution, manage the content as you continue development by providing updates, and view analytical information about usage. You use the Producer Portal to manage what a consumer sees in the Adobe Exchange Panel. There are two options for participating as a producer of Adobe Exchange content: you can use the free version that lets you submit up to 10 products of which 2 can be paid; or you can sign up to be a Commercial Producer, which allows you to provide paid and trial versions of your product (in addition to free products) and lets you make unlimited submissions. The Commercial Producer plan is currently in prerelease, if you would like to offer paid products for sale through the new Adobe Exchange, complete this brief prerelease program registration form in order to be considered. No. You are completely free to sell your products anywhere you want while using Adobe Exchange. There is no “lock-in”. Any file type can be distributed through Adobe Exchange, and multiple files can be installed in different locations. There is one important restriction: if the installation process for your plug-in includes other tasks such as modifying existing files or changing some aspect of the installation environment, that is not possible with Adobe Extension Manager. In the interests of protecting Adobe Exchange users, we will reject content that is of a criminal or unacceptable nature. For more information about what content is permissible, see the approval guidelines in the article What is Adobe Exchange Producer Portal. Can application plug-ins that use native code be distributed through Adobe Exchange? Yes, plug-ins can be sold and distributed through Adobe Exchange, but they must be packaged as ZXP files. There are tools available to help with this; see the article Packaging your Product for Adobe Exchange. After you have published a product, you can retract it to make the product unavailable through the store. However, after a product has been submitted for approval, you cannot completely delete it from our servers. You can update the details of a published product, such as the description and associated icons. Any changes you make must be submitted for approval, and are automatically published after they are approved. You can also submit upgrade or patch versions of published products. After approval, the update version replaces any earlier version. Yes. Any product that is in preview mode can be viewed in the Adobe Exchange panel. Only users with whom you have shared a product have access to that product in preview mode. To preview a product, open the panel and navigate to the MyStuff tab. Log in using the same AdobeID that you used to log in to the Producer Portal. Under the MyStuff tab, you will see your product with a preview icon. You can drill down to see how your description, icons, and images render on the panel. How do I create a ZXP file for a CS extension? How do I create a ZXP package to submit a C++ plug-in for Adobe Exchange? How do I sign my ZXP? Can I use symbolic links in my ZXP manifest? What path tokens are available for use in my package manifest (MXI file)? Extension Builder and Configurator have Export wizards that make it easy to package extensions that you build with those tools; see the Creative Suite Developer Center:http://www.adobe.com/devnet/creativesuite.html. Adobe Exchange requires packages to be digitally signed with a signature that will not expire for at least 5 years, or that contains a timestamp, and all of our packaging tools include the means of signing your package free of charge. You must provide a code-signing certificate. If your ZXP is to be installed in both CS6 and CC versions of Adobe desktop applications, you should use the “Creative Suite 6 Extension Packaging and Signing Toolkit”, available from: http://www.adobe.com/devnet/creativesuite/sdk/eula_cs6-signing-toolkit.html. If your ZXP does not need to be backward compatible with CS6 versions, use the “CC Extensions Signing Toolkit”, available from: http://labs.adobe.com/downloads/extensionbuilder3.html. The bundle ID is a unique identifier for each product. The convention is to use your organization’s domain, and then a component to identify a particular product. For example, the bundle ID for “MyProduct” is “com.mydomain.myproduct”. Yes, you can use symbolic links, but only to reference shared resources within your product’s install directory. You cannot link to any location outside the install directory. How do I sell products on Adobe Exchange? How long does Adobe take to review products? Do I need to set up pricing for all the major currencies? My organization is based in Europe, so I have to charge VAT. How is this handled? What are the maximum and minimum price points? What prevents a user from copying my product and giving it to other users? Are trials supported in Adobe Exchange? For more information about setting up with FastSpring, see Creating Paid Products in Adobe Exchange . This varies depending on the complexity of your product, the amount of testing required, and the number of products in the queue. During the soft launch period we expect a quick turnaround of one to four days. Once the solution is live this summer, please allow up to two weeks for your product to be approved. See the approval guidelines in the article What is Adobe Exchange Producer Portal. Out of the price paid by the customer, FastSpring will take a $0.65 flat fee per transaction plus 4.95% of the gross transaction amount. 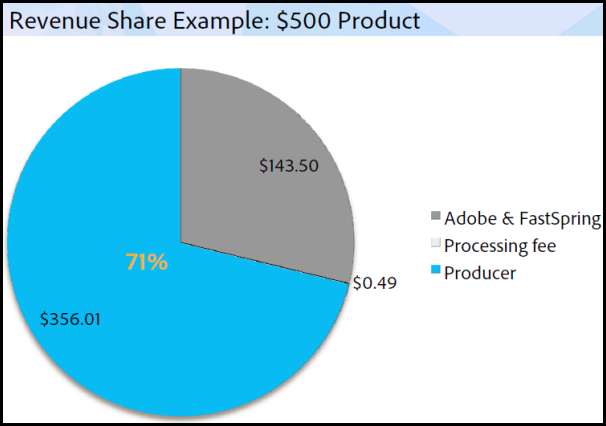 The remainder is split 75% to the Producer and 25% to Adobe. No, you only need to set a US Dollar price and FastSpring will convert the price to other currencies automatically. FastSpring will apply VAT as part of the payment checkout process. The minimum price for paid products is $5, although products can also be made available for free. The maximum price is $99,999.00. Currently, Adobe does not provide full Digital Rights Management (DRM) or copy protection for producers that upload paid content to the portal. Encryption: All files uploaded to Adobe Exchange are encrypted durin upload. Adobe Extension Manager and the Creative Cloud desktop app are the only products that can decrypt and install Adobe Exchange files. Licensing check: When a file that has been downloaded from Adobe Exchange is installed through Adobe Extension Manager or the Creative Cloud desktop app, the user will be challenged to provide Adobe credentials. These credentials will be checked against our back-end system to ensure that the user is a valid user who has purchased the product through our system. Note that we currently allow a single user who has purchased a product to install the product on multiple machines, enabling the user to use their extension easily between the various machines and devices. Using the Payment vendor serial number activation: When we set up your product with the external payment vendor, we can help you set up a system that generates a unique serial number for each user that purchases the product through Adobe Exchange. Your extension can make use of this activation serial number to ensure a product has been paid for. Please include a note to the approver requesting this option when you submit your product for approval, and please list the serial generation URL, or contact Adobe Exchange support (asupport@adobe.com) for more information about this option. Trials: While we support the concept of a feature-based trial product that is closely tied with the corresponding paid product, we do not support licensing for time-based trial products through the system. Producers can, however, implement their own time-based solutions within their trial product. Future Plans: We are actively working on providing more robust licensing functionality in the future by providing a licensing SDK that can be used by producers within their extensions. This will allow for producers to embed licensing checks during the execution of the extension rather than just at installation time. Yes, you can create a trial version of your product and then let users upgrade to the full version. Adobe Exchange does not do anything extra to handle time-based trials, but producers can build in time or usage restrictions. See Creating a Paid product for more details. Which desktop applications integrate the Adobe Exchange Panel? Where can I get the Adobe Exchange Panel? Where can I find the Adobe Exchange Panel inside desktop applications? Support is coming soon for Photoshop Lightroom and After Effects. Download the latest version of the Adobe Exchange Panel from https://adobeexchange.com. Go to Window > Extensions > Exchange to open the Adobe Exchange Panel.